While assisting Erin with her report on the China Food and Drug Administration’s (CFDA) crackdown on vampire cafés, I contacted two websites featured in her article: Alibaba.com and Harcos Labs. 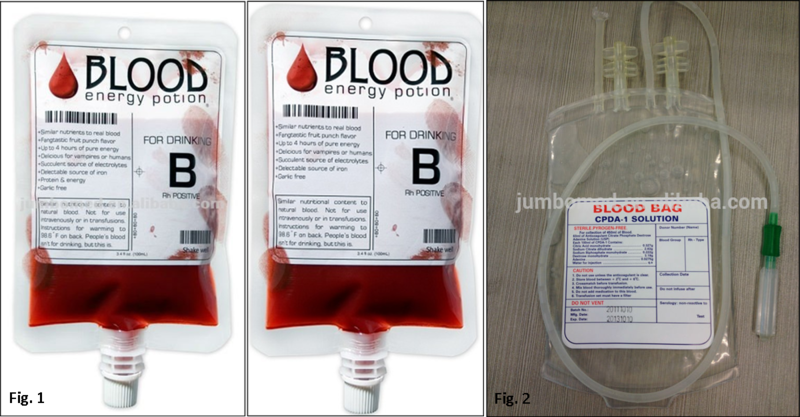 The latter, based in California, sells a product called “Blood Energy Potion”, which has been linked to the “vampire drinks” sold in the Chinese vampire cafés. Alibaba.com, run by the Alibaba Group, is a global distributor mainly based in China, Hong Kong and Taiwan. I wanted to know whether either company had any awareness of the distribution of the drink, in light of the CFDA’s crackdowns. Erin “wondered whether the product was being manufactured locally or imported from somewhere else”—especially as the links made between the “Blood Energy Potion” and what was actually being sold in the cafés suggested someone was ripping off Harcos Labs’ product. “Imported beverages without prior examinations and permissions from food safety authorities are illegal … regardless whether they are legitimate to sell in other countries,” a director of the Shanghai Food Research Institute said in a telephone interview. My question is, are you aware of Alibaba.com, a Chinese distributor which features products seemingly identical to yours, if they’re not the same products? Second, since the “vampire cafe” story went viral earlier this month, how have your sales been affected? My name is Anthony Hogg. I run a vampire-themed website called Vamped. I have a question for your company. However, your company’s website lists “blood energy potions” and the machinery used to package and cap the bags they’re sold in. Was the spokesperson mistaken? Do you have any affiliation, connection or deal with Harcos Labs, California, to distribute this product in China? Our products are not the issues, the issue is that the product is not tested by China’s FDA. So technically, China is saying the product is illegal. It would be like the US bringing over a product with ingredients that are not approved by our FDA. Yes, I am aware of Alibaba. The trouble with the internet is that customers can purchase products from us and go resell them in any country that they’d like. We have no legal document or verbal or written agreement between any company from China to sell our products. All international sales are done through a third party so we are also not aware of what gets sold to China. Also, for example, we could sell a product to the customer in the US, who then acts like a distributor and goes to resell the product to a customer in China. Unfortunately, there are a lot of hands our products could go through to get to China. Oh…and there is Amazon. Our customers sell on there so we have no idea once we sell a product to a customer, who then goes to sell it on Amazon, where that product goes. So, the product on Alibaba might be our product. A great real life story about the Blood has to do with Australia and a customer there. I worked for 1 year with an FDA consultant in Australia and the customer to come up with an approved label for our Blood potion. Australia limits the amount of caffeine in beverages and we needed to rewrite the label to say the product needed to be diluted. Also, about 2 years ago, we removed a lot of “extra” ingredients in the Blood to make it legal for consumption in Norway. Norway sees products that have B vitamins in them as a pharmaceutical – not the practice of the US. Our sales have not changed since the article has come out. 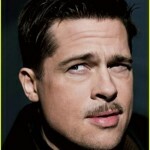 I would like to work with China’s FDA to try to get the problem solved. The product is a good one and I think the packaging is awesome! Hope this helps and let me know if you’d like more info! They also directed me to their intellectual property infringement page, “via our online system AliProtect®”. When I probed them on posting their full response, they said I could “refer to our Intellectual Property Rights Protection Policy (http://www.alibaba.com/help/safety_security/policies_rules/IPR/003.html) for your information and your linkage.” (Monday, 21 July 2014 6:44:54 PM) As of this writing, the machinery for packaging the product is still available on Alibaba.com. 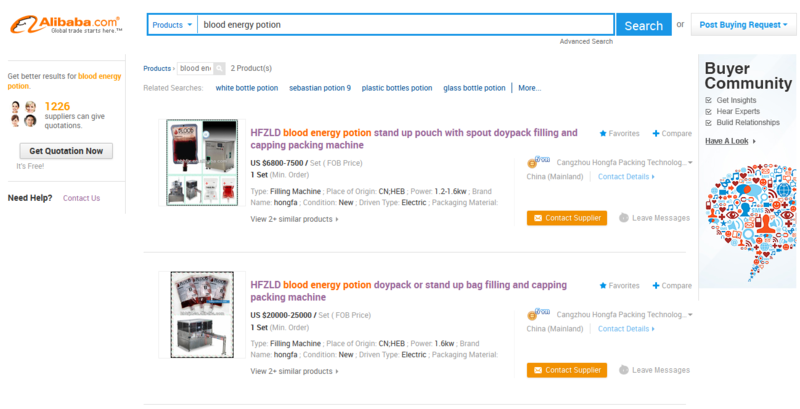 However, a picture of Harcos Labs’ “Blood Energy Potion 6 Pack” used in an Alibaba.com listing for a “Medical Disposable blood bag” has since been changed. 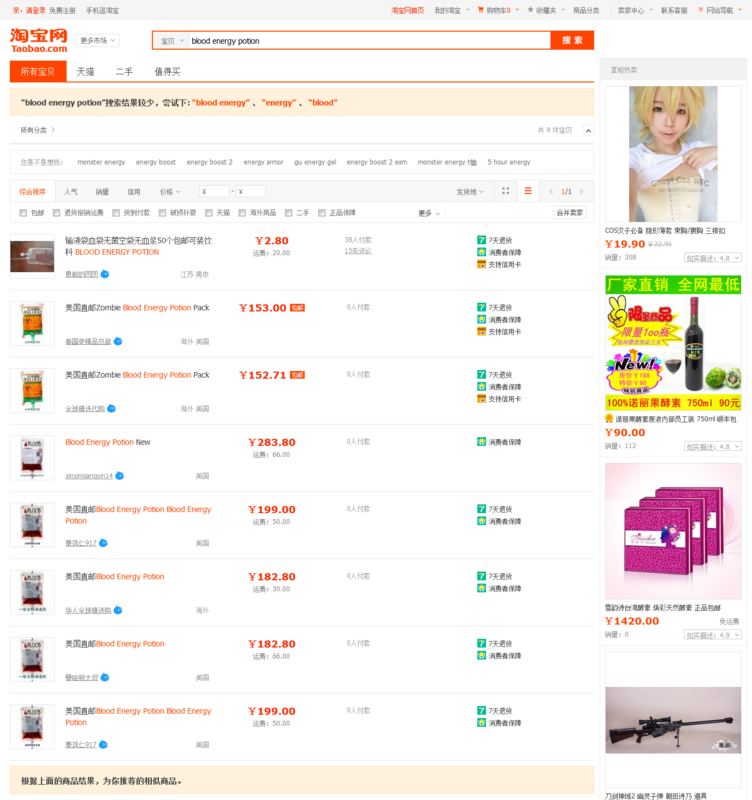 The update in Luo’s South China Morning Post article also mentioned “Despite the ban, the “vampire drinks” were still available in dozens of small vendors as of 12pm today on popular shopping site Taobao.com.” As of this writing, Harcos Labs’ “Blood Energy Potion”—and its “Zombie Blood Energy Potion”, for that matter—are still available on the website. Despite the presence of the drink in these marketplaces, the responses from Harcos Labs and Alibaba Group’s legal department make it clear that their distribution falls on consumers, not them. Their presence in China’s vampire cafés have been negated by photographs featured in various articles, clearly illustrating that the drink consumed in the cafés is clearly not Harcos Labs’ product—or, at least, not in the same packaging, suggesting a local manufacturer and distributor was “inspired” by Harcos Labs’ product and sought to make their own. Indeed, Alyssa Abkowitz notes the following in her article, “China’s Government Takes Bite Out of Vampire ‘Blood’ Beverages,” China Real Time (July 18, 2014): “It’s not just China, either: In the Hongdae area of Seoul near Hongik University, cocktails and juices are served in clear bags with IV-like straws.” The bags pictured in the article are almost identical to the ones seen in photos of “vampire drinks” consumed in the cafés. The flavour of these products is another giveaway. According to a review of the “Blood Energy Potion” on Geekologie (October 22, 2009), “it was good. It’s thick and tastes like Hawaiian Punch concentrate.” The drinks sold in the vampire cafés tend to have much more diverse flavours. The list of ingredients on the bag say the energy potion contains sodium, potassium, iron, protein, carbohydrates, and just about everything else a young vampire needs to stay in great shape. For customers who are too freaked out by the resemblance to blood, the drinks come in different colors like blue, yellow or orange. Interestingly, Spooky’s article also features two pictures of Harcos Labs’ “Blood Energy Potion”, postmarked “Chinanews.com” and “www.homeof.me”. The reference to “B-type blood energy potion” seemingly reflects the prominent “B” type featured on the product. The fruit punch flavor packs 4 hours of energy along with iron, protein, and electrolytes. Not only does Blood Energy Potion have a similar nutritional makeup to real blood, but it has the same color, look, and consistency of blood. Get real blood nutrients without that real blood taste! 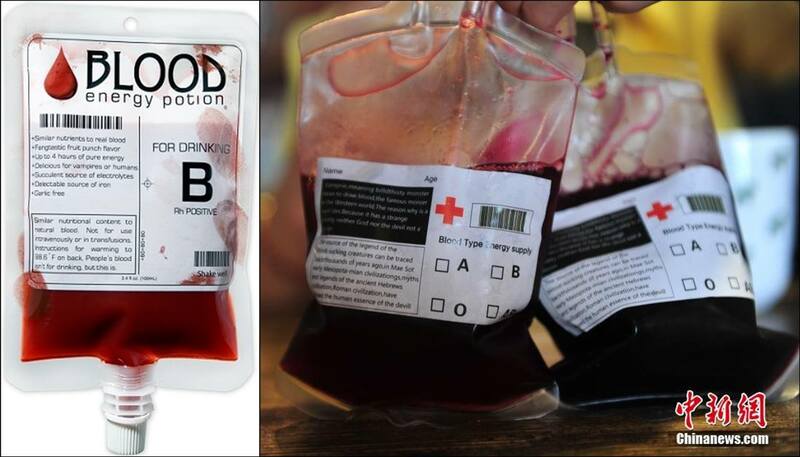 The re-sealable transfusion bag style pouch provides the convenient delivery of fluids for vampires and humans alike! Contains no real blood, just synthetic! In regards to the FDA, our label for all of our products and ingredients are approved by an FDA consultant. This means that all the ingredients we use are FDA compliant and approved for use in the US. Our manufacturing facility is also certified by various groups and agencies. Plus, our beverages are tested after they are made. More of the concern in the US with energy drinks is the ingredients and the controversy that they cause if too many are consumed. As a health professional, I feel they problem with US made energy drinks lies in the large doses of caffeine mixed with other stimulants like guarna, green tea, ginseng, yerba mate, and ginko. See http://www.caffeineinformer.com/energy-drink-ingredients. Many of these ingredients are herbs, which are not regulated by the FDA or studied in the quantities that are in a lot of energy drinks. Our Blood is pretty simple – water, sugar, caffeine, and a few special ingredients from the blood of young virgins. 🙂 We have a statement not to consume more than 2 drinks in one day. Her reply has been reproduced with permission—and I would like to take this opportunity to thank her for her friendliness, openness and co-operation with Vamped. Thank you, Natalie!